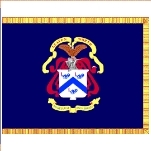 The Command and General Staff College (CGSC) is a graduate school for U.S. military and foreign military leaders at Fort Leavenworth, Kansas. It is the Army’s senior tactical school and introduces officers to operational and strategic warfare. The college has five subordinate schools, and its main purpose is to synchronize Army leader development and education systems, but works as a joint, interagency, multinational school with sister services and international officers in the faculty and student body. The Command and General Staff College (CGSC) was founded in 1881 at Fort Leavenworth by General William T. Sherman. Its original name was the School of Application for Infantry and Cavalry, which got shortened over time to the Infantry and Cavalry School. It was the army’s first postgraduate school, and focused on training superior cavalry and infantry officers on foot and horseback. Large numbers of majors and captains were taught to be staff officers who could serve in various brigades, battalions, corps, and divisions. In 1907 the Cavalry School changed its name again, this time to the School of the Line. The institution’s curriculum grew and evolved through the 20th century, adapting its teachings based on the experiences and lessons of the many wars and armed conflicts in which the U.S. has participated. With the school’s name changing yet again—this time to the current Command and General Staff College—CGSC was the only higher level military school not suspended during World War II. At that time, the school focused on division command and staff operations. Since World War II, CGSC has had the reputation of being primarily a school for U.S. Army majors, in spite of the fact that it oversees other schools and educates officers from different military services, as well as from other countries. Since 2008, the CGSC has been part of CAC Leader Development and Education (CAC LD&E). In addition to its main campus at Fort Leavenworth, the college operates satellite campuses at Fort Belvoir, Virginia; Fort Lee, Virginia; Fort Gordon, Georgia; and Redstone Arsenal, Alabama. These satellites provide non-residential “distance learning” programs. The Command and General Staff College (CGSC) is one of the 33 schools under the U.S. Army’s Combined Arms Center (CAC), each of which is responsible for training specific branch skills and serving as the Army’s functional expert in that area. The CGSC, as an Army educational and training facility, focuses on the areas of infantry and cavalry. The CAC is under the guidance of the U.S. Army Training and Doctrine Command (TRADOC). The TRADOC is a military command of the United States Army that oversees training of Army forces, the development of operational doctrine, and the development and procurement of new weapons systems. The CGSC is the umbrella college for five constituent schools. The Command and General Staff School (CGSS) focuses on educating and training intermediate level Army officers as field grade commanders and staff officers. The school has six departments: the Department of Army Tactics; the Department of Joint, Interagency and Multinational Operations; the Department of Logistics and Resource Operations; the Department of Military History; the Department of Distance Education (see below); and the Department of Command and Leadership. Additionally, the CGSS supervises the CGSC Command to the Nation program; the program involves community outreach to promote the understanding and appreciation of the Armed Forces as civilians in their communities, and as military professionals. CGSS’s Department of Distance Education (DDE) program develops, distributes, and administers CGSC’s distance learning courses to active and reserve officers. According to their website, these are intended to teach leaders “to execute full-spectrum joint, interagency, and multinational operations through non-traditional means” (“non-traditional means” are methods of warfare other than combat between two or more national armed forces). While founded for the Army, the DDE also provides this training to active and reserve officers in the U.S. military’s other branches through its sister services. CGSC’s School of Advanced Military Studies is a graduate program that educates officers in military art and sciences. The program primarily focuses on military history, military theory, and execution-based practical exercises in order to develop cognitive-solving skills. The school also has a two-year Advanced Operational Art Studies Fellowship to prepare senior officers for colonel-level command and for operational planning assignments to combatant and service component commands. CGSC’s School for Command Preparation is aimed at preparing command selects, command sergeant major selects, and their spouses for effective command team performance when the Army is at war. Additionally, the school provides simulation enhanced tactical training for students and faculty members of CGSC. The School of Advanced Leadership and Tactics offers continuing education for the development of First Lieutenant toward selection for Major. The goal is for officers to master tactical and technical skills, leadership and command competencies, and battalion and brigade staff processes. Other U.S. military branches are also affiliated with the Army’s CGSC and they have their own organizations to support the education and training received at the different schools. The Air Force Element works to educate future senior leaders in the CGSC on principles and applications of air and space power as well as strategic, operational and tactical use of military force. The Navy Element began with the first Navy liaison officer in 1931. The Marine Corps Element provides instruction on expeditionary and amphibious operations. The Element provides a connection between the Combined Arms Center, the Command and General Staff College, and the activities and personnel of the U.S. Navy. The Combined Arms Research Library is a military science research center for the CGSC, as well as the post library for Fort Leavenworth. Not only does the library provide resources for the officers, the community library is open to their families and includes a children’s section and story time. Their links section provides links for each U.S. military branch, military history, and information on current issues such as Iraq, Iran, and Somalia. The CGSC also has a Quality Assurance Office that does evaluations on the procedures within the college. The office looks at paper and Web surveys, telephone surveys, focus groups, structured interviews conducted in person, and observations. The Command and General Staff College (CGSC) spent more than $1.1 million on four contractor transactions between FY 2002 and FY 2012, according to USAspending.gov. The two contractors who did business with CGSC were Kansas State University, which was paid $1 million for supplying educational studies and analyses, and Information Systems Support, which earned $119,881 for providing ADP and telecommunications services. On June 28, 2013, Brigadier General Christopher P. Hughes was named deputy commandant of the U.S. Army Command and General Staff College in Fort Leavenworth, Kansas. Hughes is from Red Oak, Iowa, having moved there in 1972 with his family after his father retired from the Air Force after 23 years. He graduated from high school in 1979 and went on to attend Northwest Missouri State University, where he took ROTC and graduated with a B.S. in political science and a commission as an Army second lieutenant in 1983. Hughes progressed up the Army ranks and in 1995 earned an M.A. in business management from Webster University in St. Louis. His first prominent assignment came when he was named lead terrorism investigator on the commission that looked at the 2000 bombing of the USS Cole in Yemen by al-Qaeda. By 2003, Hughes was a lieutenant colonel in command of a battalion of the 101st Airborne Division as it served in Najaf, Iraq. His unit was assigned to talk to Grand Ayatollah Ali Hussein Sistani, whose support was necessary for his unit’s success in the town. As Hughes and his unit approached Sistani’s residence, a crowd formed and began to get ugly. In response, Hughes held his rifle at arm’s length, muzzle down, and ordered his troops to take a knee and smile. Hughes and his unit then left the scene. He drew much attention, even being mentioned in one of President George W. Bush’s weekly radio addresses, for diffusing the situation. Sistani later issued a proclamation asking Najaf’s residents to cooperate with the Army. After his tour in Iraq was up, Hughes was assigned to the Pentagon, a situation he found as challenging as his combat tours. He wrote a book about the experience, War on Two Fronts: An Infantry Commander’s War in Iraq and the Pentagon (2007). In 2005, Hughes earned an M.A. in national security studies from the National Defense University. Some of Hughes’ stateside assignments were Executive Officer to the Secretary of the Army and Chief of Army Liaison to the U.S. House of Representatives. His more recent assignments include Deputy Commanding General for Support and as the Special Assistant to the Commanding General, 3rd Infantry Division in Fort Stewart, Georgia, where he earned his general’s star. Shortly thereafter, he deployed to Afghanistan. Hughes is married; he and his wife Marguerite have three children. One is following in his father’s footsteps—son Patrick earned an Army commission after graduating from Northwest Missouri State.